The TJX Companies, Inc. (TJX) operates as an off-price apparel and home fashions retailer in the United States and internationally. It operates through four segments: Marmaxx, HomeGoods, TJX Canada, and TJX Europe. TJX Companies is a dividend achiever, which has raised dividends for 22 years in a row. The most recent dividend increase was in March 2018, when the Board of Directors approved a 25% increase in the quarterly dividend to 39 cents/share. The company’s largest competitors include Ross Stores (ROST), Kohl’s (KSS) and Target (TGT). Over the past decade this dividend growth stock has delivered an annualized total return of 19.20% to its shareholders. Future returns will be dependent on growth in earnings and starting dividend yields obtained by shareholders. The company has managed to deliver a 17.70% average increase in annual EPS over the past decade. TJX Companies expects diluted earnings per share to be in the range of $4.73 to $4.83 in FY 2019. In comparison, the company earned $4.30/share in FY 2018. Earnings per share have also been aided by share buybacks. The number of shares outstanding has decreased from 983 million in 2006 to 646 million by 2018. I like the fact that management is focused on delivering excess cashflow and then sharing that cashflow with shareholders in the form of higher dividends and share buybacks. While I would prefer special dividends to buybacks, I will take what I can get. Future growth in earnings per share will be driven by opening new stores, increasing same store sales, increasing margins, lowering costs and repurchasing shares. I like the fact that TJX has a better scale in number of stores, purchasing agents and contacts, relative to its close rivals. This could translate into better bargaining power with suppliers, lower prices and high margins. The company has over 1,000 buyers and 18000 vendors it works with. The company sells branded quality fashion at discounted prices. It has a wide demographic reach and global sourcing capabilities. The type of company like TJX can prosper even during a difficult economic conditions, since it offers discounted branded fashion products to consumers. Same store sales will be increased by attracting more traffic, expanding e-commerce, and continuing to provide a great assortment of great values on fashion, brands and quality. Loyalty programs and increase in marketing can result in retention of customers and attracting new ones to the stores. Maintaining a low inventory turnover rate of less than 2 months can also help in reducing markdowns and ensuring that a fresh new inventory assortment is available for repeat customers. The company has 4070 stores as of fiscal year 2018. This includes 2285 TJ Maxx or Marshal’s stores, 667 Homegoods stores in the US, as well as 454 stores in Canada operating under the names Winners, HomeSense and Marshalls. The store count also includes 540 TK Maxx stores in Europe, as well as 55 HomeSense stores. The company also has 38 TK Maxx stores in Australia. TJX Companies expects that the number of stores under its umbrella could eventually reach 5475. The projections include 3000 TJ Maxx or Marshal’s stores, 1000 Homegoods, 500 TJX Canada and 975 TJX Europe. The company believes that the European market could handle approximately 1,900 stores at its peak, which means there is plenty of room for expansion there. While store saturation in the US is a potential risk, international expansion could bring a source of growth for years ahead. As international operations expand their scale, this could aid operating margins and profits. The downside to international operations is that a larger portion of TJX profits will be impacted to short-term fluctuations in the US dollar. TJX Companies is also focusing on expanding its e-commerce platforms such as tjmaxx.com and sierratradingpost.com in the US and tkmaxx.com in the UK. Further sales growth could be obtained by leveraging the brick and mortar and online platforms. An example includes allowing customers to shop online and pick up items in stores. I really like the fact that TJX Companies is dedicated to sharing excess cashflows with shareholders in the form of share buybacks and dividends. I would actually prefer more dividends to buybacks, but would take what I can get. The annual dividend payment has increased by 21.30% per year over the past decade, which is much higher than the growth in EPS. 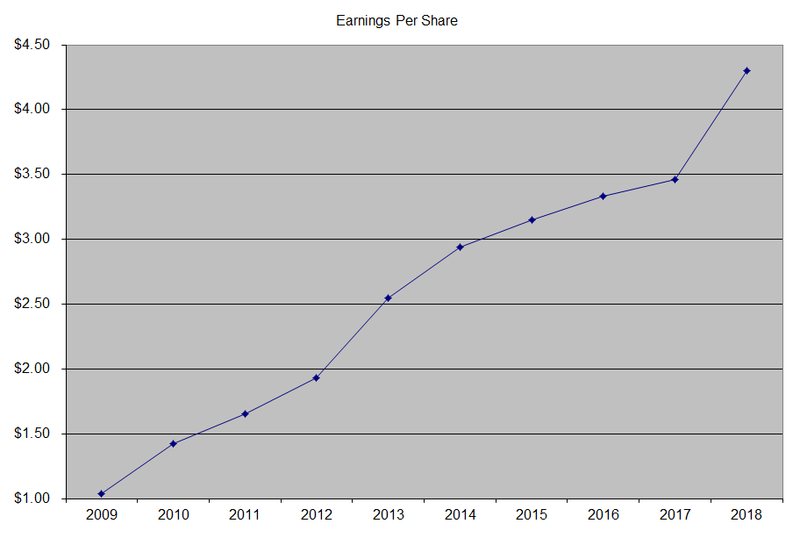 Future growth in dividends will likely exceed growth in earnings per share given that the payout ratio has room for expansion. 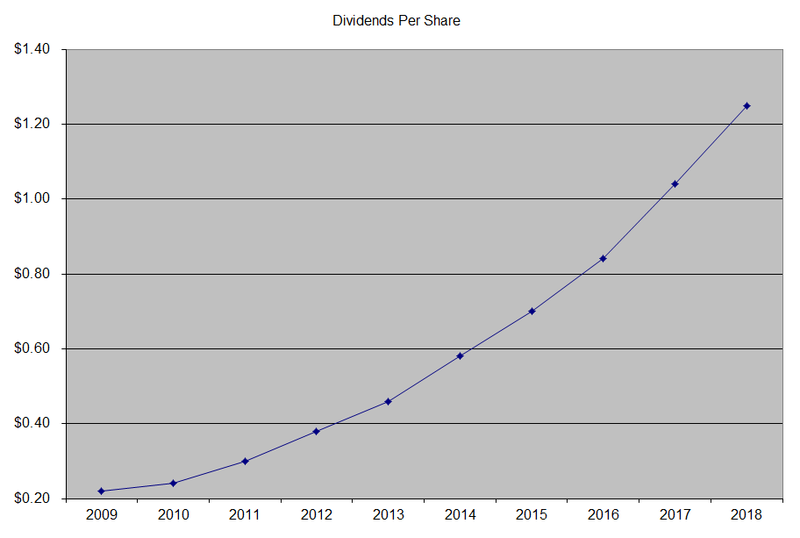 A 21% growth in distributions translates into the dividend payment doubling almost every three and a half years on average. 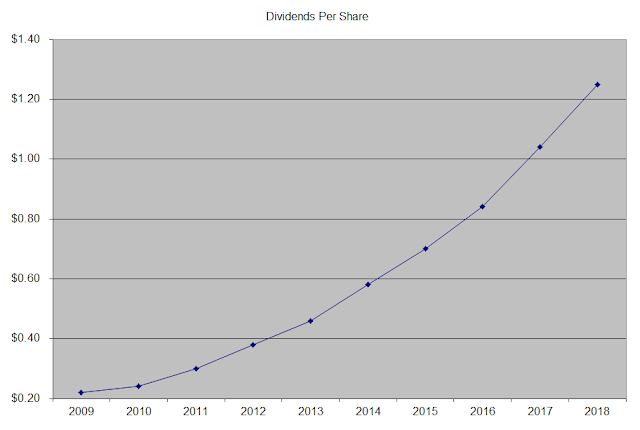 If we check the dividend history, going as far back as 1997, we could see that TJX Companies has managed to double dividends almost every three and a half years on average. 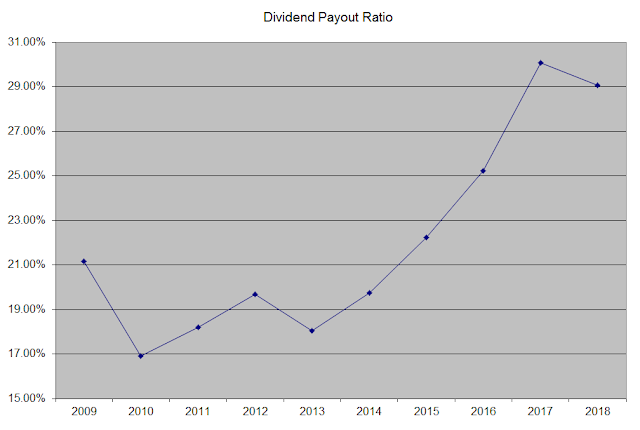 In the past decade, the dividend payout ratio has increased from 21% in 2009 to 29% in 2018. A lower payout is always a plus, since it leaves room for consistent dividend growth minimizing the impact of short-term fluctuations in earnings. Currently, TJX Companies is fairly valued at 19.50 times earnings and yields 1.90%. Based on forward earnings estimates, the stock looks even cheaper at 17.70 times forward earnings. I like the growth story and the growth prospects behind this company. Having a position in TJX Companies is a good hedge against the shopping done at this store by members of my immediate family.